Cape Scott Provincial Park is a remote backpacking adventure located on the northern tip of Vancouver Island in British Columbia, Canada. For years Cape Scott has been a secret for many who backpack in BC, Canada - often hidden in the shadows of the West Coast Trail. 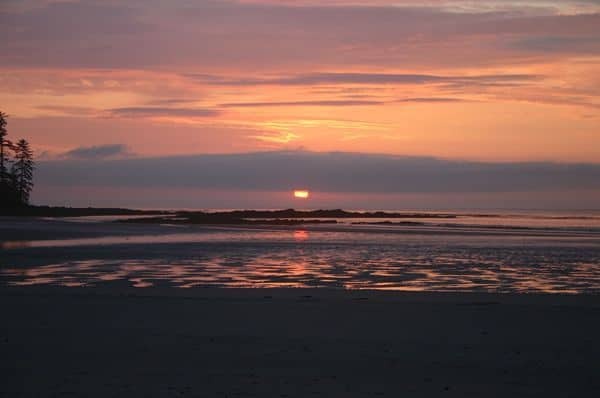 The main features of the park which catch people by surprise are the underpopulated string of beautiful sandy beaches - San Josef Bay, Nels Bight, Guise Bay, Experiment Bight and Nissen Bight Beaches. Together they combine for over 100 kilometres of white sand wilderness camping bliss. Cape Scott Provincial Park was established in 1973. 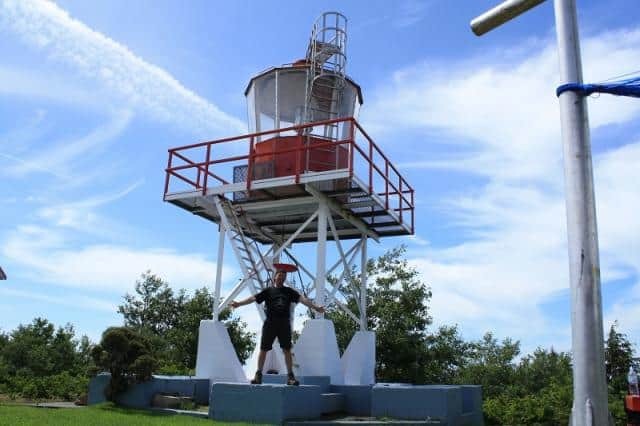 The 22,294 hectare park includes a 50+ kilometre return backpacking trail connects to a lighthouse while visiting beaches and a historic pioneer settlement. The lighthouse in the park has been guiding mariners pass the harsh rocks and battered coastlines since the 1960's. 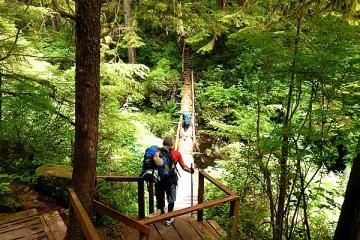 The 24 kilometre one-way backpacking trail leads backpackers through lush old-growth forests, thick wetland bogs and plenty of mud swamps (especially in rainy season). The hiking route is, by no means easy, and is considered a difficult hike with unpredictable weather conditions. One day can be filled with sunshine and the next torrential rains. 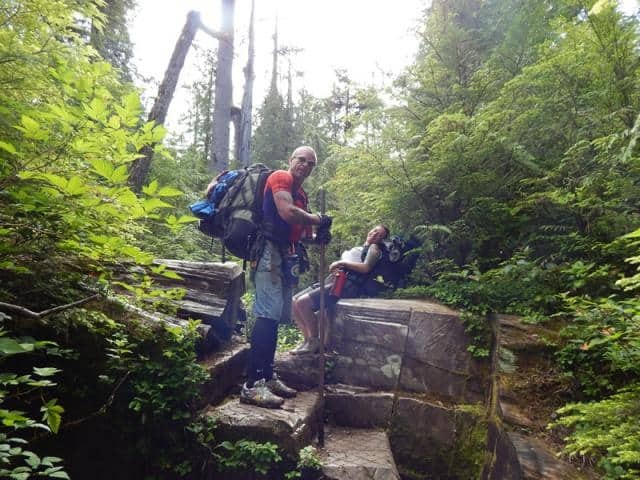 The trail is considered by us as one of the best wilderness backpacking experiences we have encountered in Canada! So much so we have hiked Cape Scott 4 times. The trail is a history lesson for many about the many struggles of our earliest pioneers. In 1897 and 1910, a group of Danish pioneers settled near San Josef Bay and in Hansen Lagoon. The harsh winter storms made life difficult for the pioneers. The conditions were so tough on the early settlers , many did not stick around. Some left so quickly they left their belongings behind. Today. one can view their tools, livestock fencing and historic buildings during their hikes. Please do not disturb as the items are now historical artifacts. The backpacking trail explores many different types of terrain. There are sections of the trail walking over raised boardwalk paths, along long sandy beaches, slogging through mud, crossing bridges, high stepping tree roots and boulders. There are hills to climb (mostly at the beginning of the trail). Located along the trail are various wilderness campsites. 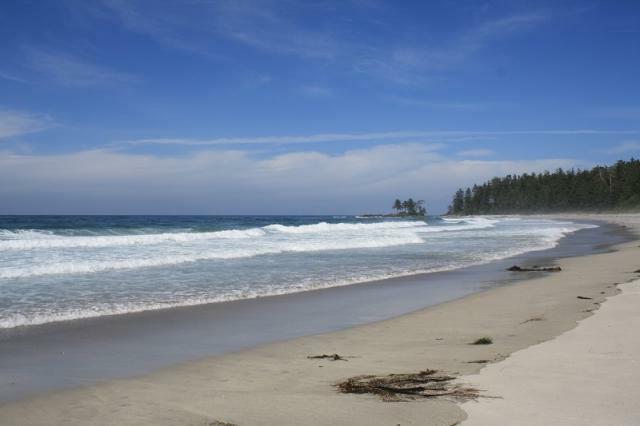 San Josef Bay is the most easily accessible sandy beach campsite in the park located 2 kilometres from the trailhead. It is only 45 minutes from the parking lot to the beach walking along a well maintained boardwalk path. There are rusty artifacts, a cement foundation of the home, store and post office of Henry Olsen which operated until 1944 found alongside the trail leading to San Josef Bay. This short trail is a great day hike if backpacking is not your thing. Backpackers should note that a trip to San Josef Bay is a side trip that requires hikers to double back when hiking the entire trail to the lighthouse. 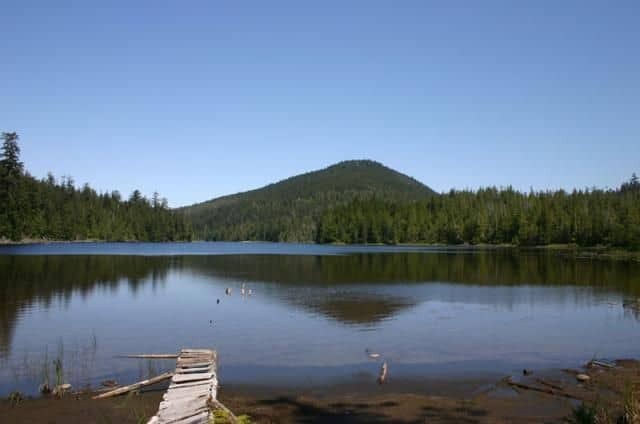 After San Josef Bay, once back on the main trail, backpackers hike 3 kilometres to Eric Lake. At the lake are some tent platforms, a food cache storage unit and some pit toilets. Continue backpacking past Eric Lake for 25 minutes and there are giant Sitka Spruce trees reaching 7.2 meters in circumference. Next stop on the route is Fisherman River. Fisherman River is 9 kilometres (3-4 hours hike) from the Cape Scott parking lot. Along this portion of the route there are remnants of old fence posts, telegraph communication lines, a wooden cart and an old tool shed and the first motorized tractor wedged between two trees. Hansen Lagoon is 15 kilometres (5 hour hike) from the Cape Scott parking lot. Hansen Lagoon is where the three tributaries of Fisherman River empty into the sea. Again the past is on display as there is evidence of an old dyke that the settlers used to reclaim land for agriculture and a boiler that was used in 1898 as a milk condensery and sawmill. Next on the journey are the beautiful string of sandy beaches starting with Nissen Bight. For the truly rugged experience hikers can extend their backpacking adventure by hooking into the North Coast Trail when visiting Nissen Bight. At the far end of the beach is the trailhead. 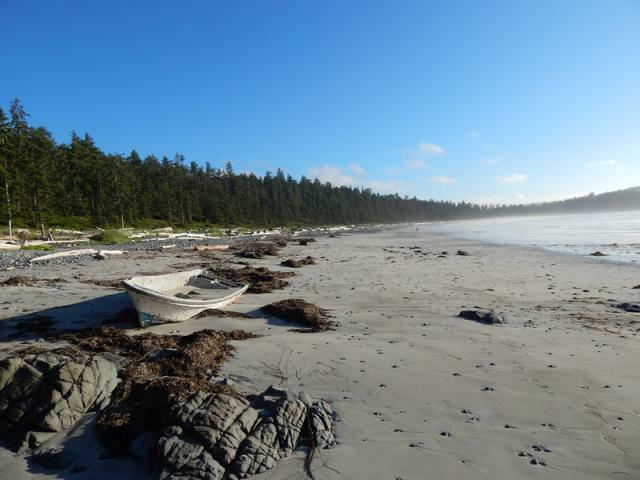 The North Coast Trail is a 46 kilometre adventure connecting Nissen Bight to Shushartie Bay. Guise Bay is 20 kilometres (7-8 hour hike) from the Cape Scott trail head. Here, a small trail 50 metres before Guise Bay leads to the remnants of a store used during the second World War and from the beaches of Guise Bay are two cabins used as barracks during the war. There is wilderness camping facilities at San Josef Bay, Eric Lake, Fisherman River, Nissen Bight, Nels Bight and Guise Bay. When backpacking the Cape Scott Trail be prepared for adverse weather conditions. High winds and heavy rainfall is a common experience in the park with little warning signs. How to Get Here: The turn off to access the gravel road leading to the Cape Scott Trail is located southwest of Port Hardy, BC, Canada. Follow the gravel road for 63 kilometres past the community of Holberg. From Holberg keep an eye out for the road signs pointing the way to the trailhead parking lot.